The new academic year is almost upon us. The coming weekend is likely to be one of nervousness for some teachers (and pupils alike) as we turn over in our minds the possibilities of the next ten months. If you are generally struggling to sleep, this 'Teacher's guide to sleep' from the Guardian website might help. Over the years I have learned to actively recognise that this particular point of the year is naturally a period of heightened worry and, in turn, I allow it to pass by far more easily by not tuning in too much to worrying thoughts that occur. This includes (particularly so) those moments of feeling wide awake in the night - instead of worrying about the year ahead and adding to that worrying how I am not sleeping, I actively label thoughts 'just a passing worry' and focus my attention 'outwards' on the sounds of the night, sometimes even spending a bit of time looking out of the window at the strange landscape of the midnight street. "The word "ruminate" derives from the Latin for chewing cud, a less than gentile process in which cattle grind up, swallow, then regurgitate and rechew their feed. Similarly, human ruminators mull an issue at length." >> “Rabbit's clever," said Pooh thoughtfully. >> "What I like doing best is Nothing." 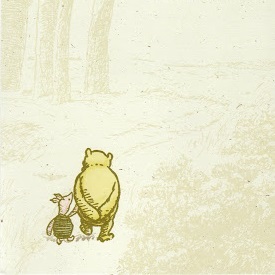 How do you do Nothing," asked Pooh after he had wondered for a long time. So here's to a good year to colleagues and pupils - stay steady!